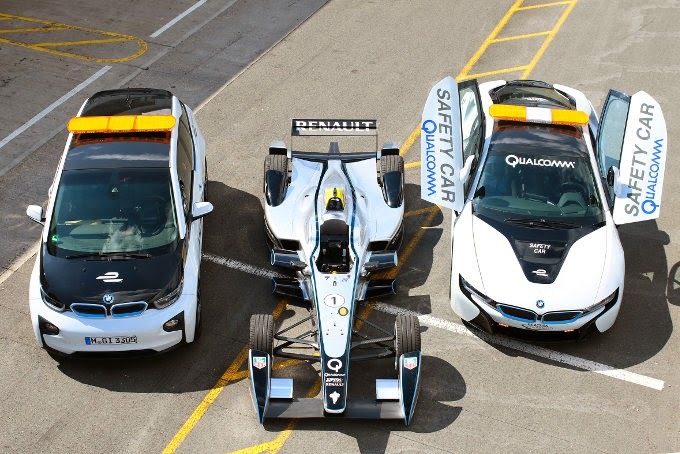 The all-electric FIA Formula E Championship has today confirmed that its course cars for the inaugural season will be fitted with Qualcomm Halo™ wireless charging technology – an inductive charging system which allows the car’s battery to be charged without the use of cables. With the final specification of car set to be announced shortly, the championship’s technical team took advantage of today’s final test at Donington Park to trial two BMW i8 and two BMW i3 models with the aim to evaluate them for the series’ official course cars. Earlier this year, the German marque was part of the Global Launch event of the Formula E in London. All four BMWs have been specifically modified to meet FIA requirements, with one of the BMW i3 models featuring an inductive charging system from Qualcomm Incorporated (NASDAQ: QCOM), with the remaining three vehicles set to be adapted at a later stage. The technology has been developed by San Diego-based Qualcomm Incorporated, one of the official Founding and Technology Partners of the series and a global leader in 3G, 4G and next-generation wireless technologies. The Qualcomm Halo™ technology uses resonant magnetic induction to transfer energy between a ground-based pad and a charging pad fitted to the underside of the vehicle. The cars can then simply park over the base pad for charging to start automatically. The chosen safety car – which will be officially entitled the Qualcomm Safety Car - will be driven by experienced driver Bruno Correia, whilst the medical and extraction cars will be overseen by FIA Medical Delegate Dr Phil Rayner and his team. The cars will be positioned at the end of the pitlane, charging wirelessly and ready to be rapidly deployed as required during each practice, qualifying and race. Formula E is the FIA’s new fully-electric single-seater championship designed to appeal to a new generation of motorsport fans, whilst accelerating the interest in electric vehicles and promoting sustainability. Competing entirely on city-centre circuits – with races also in China, Malaysia, Uruguay, USA, Monaco, Germany and the UK – it uses cars capable of speeds in excess of 150mph (225kph). Its 10 teams and 20 drivers feature some of the leading international names in motorsport including Alain Prost and Michael Andretti, along with high-profile environmental supporters including Sir Richard Branson.